The Sitges – International Fantastic Film Festival of Catalonia Festival has established itself as a prestigious showcase for screening new horror movies talents and, at the same time, new ways to represent this genre. 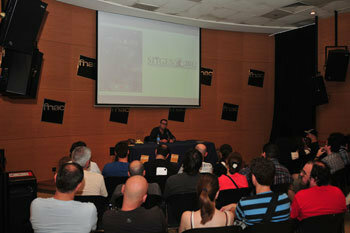 This is the reflection made by its director, Àngel Sala, who made the most of a meeting with fans held yesterday, Thursday July 12th, at the Barcelona FNAC in the Triangle, to stress Sitges’ commitment to up-and-coming directors and give them a preview of new confirmations that will be a part of the program at this year’s Festival, that will be held from October 4th to the 14th. All of this new blood, including different styles under the same banner of innovation, will also be represented this year with films like The ABCs of Death, V/H/S, Antiviral, Excision or You’re Next. All of them are the greatest exponent of this change in tendencies in fantastic and horror cinema. An assertive effect to show what some already know as the talent of the new millennium. David Cronenberg and his son Brandon will be adding a touch of color to a generational duel that they started at the Cannes Festival and that, in Sitges more than anywhere else, reflects the evolution genre has experienced in recent years. So while the father will be presenting his dark drama Cosmopolis, with media icon Robert Pattinson heading the cast, the Cronenbergs’ heir debuts at the Festival with Antiviral, a story that depicts a teenager’s obsession to sell celebrities’ viruses to their sick fans. But if it’s a question of satisfying the most fervent fans, this mission has been taken on by The ABCs of Death. Original in both its approach and execution, the film brings together 25 directors from around the world –all of them obviously, connected to fantastic or horror cinema– and hands each one letter of the alphabet. Their challenge: to pick a word that starts with this letter and, in a sort of creative chain, shoot a short film based on death using the selected word as its central theme. An extravagant game of clues to delight an audience that also had a say in it. Because the last letter of the alphabet, the 26th, was reserved for the amateur director who received the highest number of votes in the contest T is for Toilet. In this case, Lee Hardcastle. Along similar lines, V/H/S is also the final result of a convention of anthological directors, among which are Adam Wingard, David Bruckner or Ti West. Each of them was in charge of making one of the different shorts that make up this choral movie, based on a group of bungling delinquents hired to recover a videotape. A body surrounded by old VHS tapes is the starting point for a story that, as it goes on, becomes more and more bloodcurdling. Equally violent, but with a more comical and surreal feel, is the film Excision, written and directed by Richard Bates. The storyline focuses on a disturbed student whose only goal is to be successful in the field of medicine, as her controlling mother has instilled in her. This will lead her to extreme situations, where she will have to overcome the social rejection caused by her sexual fantasies and her love of macabre surgery. A bloody, hilarious piece that many have defined as Carrie directed by John Waters. And, finally, You’re Next. A suggestive title where Adam Wingard takes the slasher subgenre and turns it inside out like a rabbit skin to totally transform bloody psychopath stories and, while at it, gain the spectator’s complicity with a truly original final result. The story starts out with a famíly that gets together to celebrate their parents’ wedding anniversary. But afterwards, a gang of assassins with mysterious intentions will burst in to spoil their fun. Next Post Sitges 2012: The Definitive Line Up. Wallop!